After extensive debate, voice raising, a significant amount of arguing, hemming, hawing, general discourse, a few instances of leaving in a huff, and an inquiry to our kind and knowledgeable readers, we've come to a consensus on our rather difficult decision to keep, modify, or discard our brand new order of wainscoting. But before I deliver the final verdict, lets take a step back to see what got us to this point. 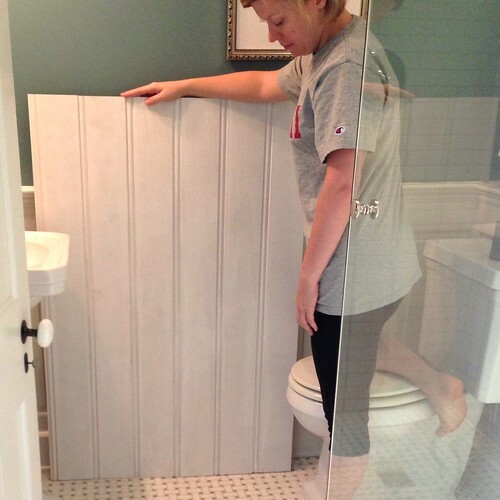 A few weeks ago we told you all about the various beadboard wainscoting options we had for our master bathroom. The profiles we were looking into offered several different styles of beadboard, from the decidedly traditional with small panels and small beads, to the very non traditional of large panels with large beads. The profile list we shared even had a non beadboard single panel with V grooves as an option. After internal struggle we decided on the WC 101 profile and eagerly awaited our order. But when it arrived and we broke open the first box, it wasn't at all what we expected. I liked the very wide width of the panels, but the bead seemed oversized to me. It felt like the bead should really be about half the size it was. Conflicted, we did what all normal people do, we turned to our blog to seek opinion by way of a complaining blog post. (That's "normal," right?) Thank you for enabling us in our unhealthy way of dealing with a conflict. We have to say, the various comments where overwhelmingly helpful. Several people commented that they actually found nothing wrong with the option we selected and were not overtly offended by the sight of it (as I believed we feared everyone might have been). Everyone was extremely supportive and honest (either good or bad), gave level headed opinions and suggestions, expressed empathy, and most even encouraged patience and to give the beadboard the opportunity to grow on us. And best of all, most confirmed our idea that this was just a part of the sum total of the bathroom, and not the whole bathroom itself. It will eventually blend with the room and become an element to the overall, so we shouldn't worry so much. These responses were all EXACTLY what we needed to hear. Each and every word of it!! And most importantly of all, several people brought up the idea that this beadboard isn't the typical beadboard you see nowadays. Perfect! 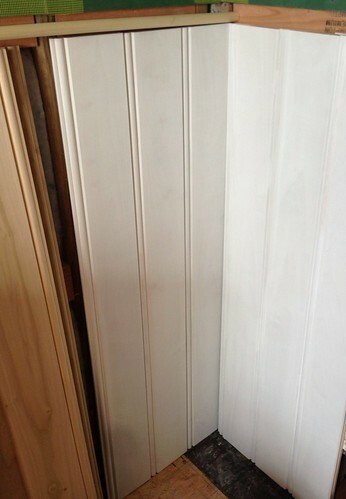 The fact is, we don't want the beadboard that everyone else has. 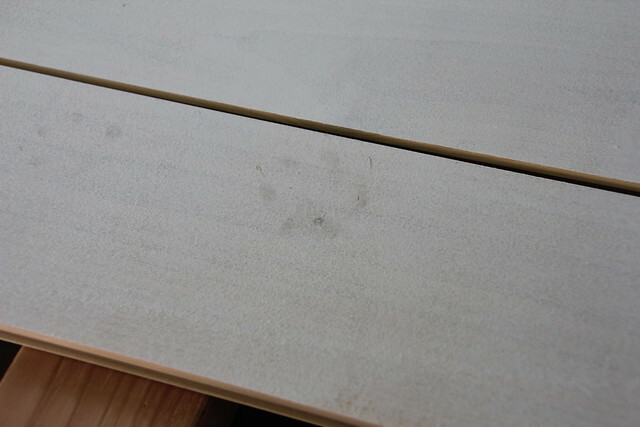 We don't want the inch and a half strips that just as easily come in 4x8 sheets of beadboard plywood. We want to be different, unique, and genuine to the period of our home, which this large beadboard actually is. 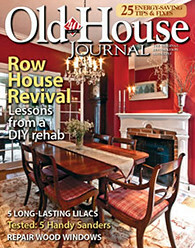 It's also not just for the sake of being different, but because our house is a city house, not a cottage, and this profile was more traditional in a city dwelling, the beadboard we were having some to significant buyers remorse over turned out to maybe, just maybe, our beadboard was just right. So rather than attempting to alter what we had purchased, either by splitting the panels with a V groove, or reducing the size of either the bead or width of the panels, we took a far more level headed and less permanent approach of starting by priming six panels to just see how they looked. 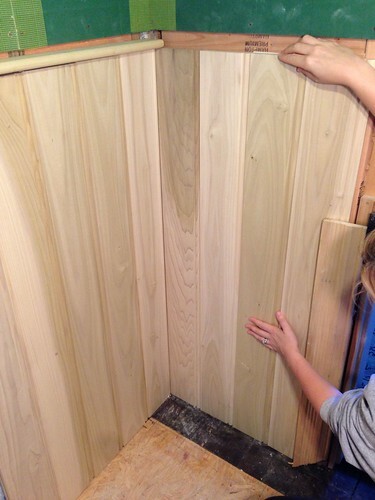 This decision was one that offered an immediate glimpse into how the beadboard will eventually look. White is a rather amazing color, and when the item you're painting white is finally covered, the details and intricate patterns take on a whole new look. Precisely what we needed at this time. Holding the panels up on the wall showed new depth and shadows on the beads. These shadows helped to hold the perceived size of the bed down a little bit, making it feel much more how we'd like it to feel. We also held it up in the guest bathroom in an attempt to comprehend how it might look in a finished room without cracked walls, plywood floors, and dirt all over the place. Though the scale is admittedly quite large for that space, it actually didn't look half bad. We even spent an inordinate amount of time Googling, Pinteresting, Houzzing, and whatever other website-ing we could think of to find examples of wide beadboard installs. You know what? There were plenty of them, and I didn't find the beadboard offensive. 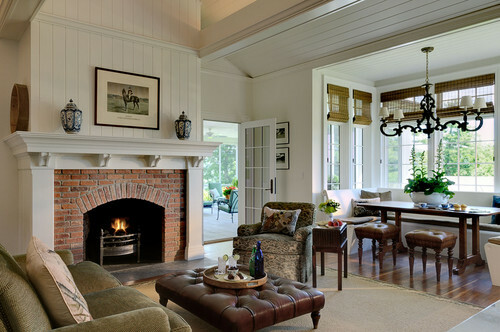 In fact, we sort of liked how it looked, especially in finished rooms such as the one below. Then we did a lot of contemplating. After each of us stood motionless in the silent room staring at the walls for an obscene amount of time, it all started to change a bit, and we began to feel a general sense of relief. Maybe, just maybe, it might be okay as is? Rather than spend a tremendous amount of time on altering the wainscoting, we opted to move ahead and prime the back side of all panels. Taking a page out of our successful siding preparation steps, we've opted to prime both the fronts and backs of the boards with oil based primer. Our thought is simple, these boards are being installed in a room that has higher humidity than most other rooms, and larger standard temperature ranges, so the possibility the wainscoting could shrink or grow definitely exists. 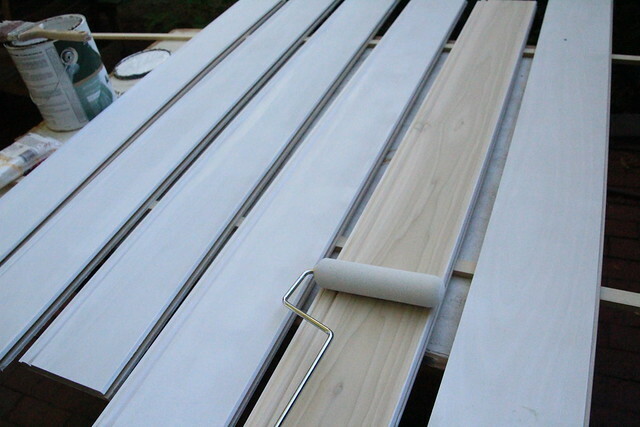 By priming all sides with an oil based primer, we're taking the steps necessary to help prevent moisture from entering the wood, thus making it unstable. 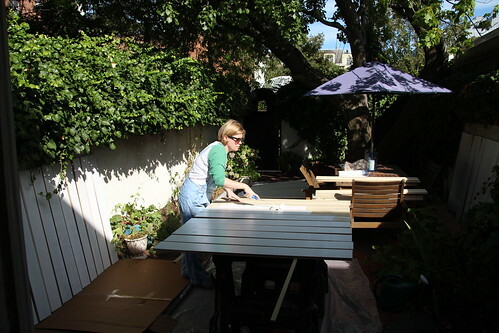 Wendy and I spent a whole day in the back yard prepping and priming the sixty individual boards. 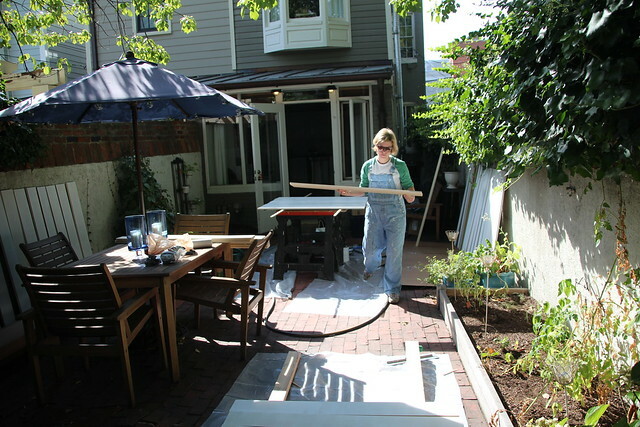 While I sanded the bead and chamfered edges of each board, Wendy rolled primer on the backs and sides of each and every one of our many, many wainscoting lengths. We ended up stacking the panels all over the yard. They were on the walls, on the ground, on the saw horses, they were everywhere. Unlike latex primer, dry time on oil based primer is closer to three to four hours then the minutes we're used to, so it had to sit all over the place for quite some time. Normally that's fine, but when your back yard is small, and your dog loves running around where you're working, you end up with paw prints where you don't want them, and paint on paws where you don't need it. 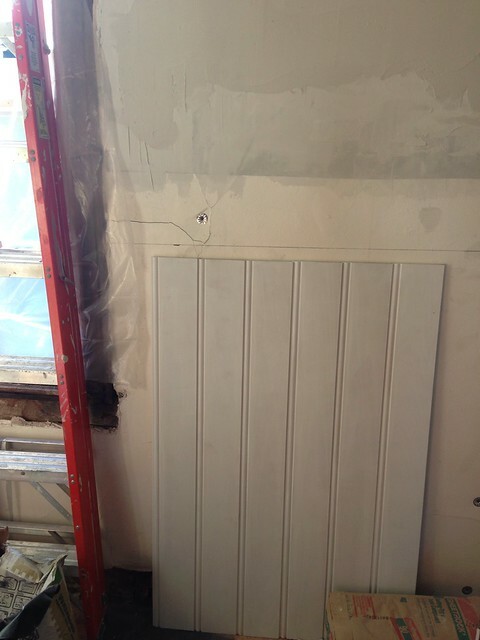 After a very long day of working, we finally have our panels primed and are ready to turn our attention to how we'll eventually install this wainscoting, but that's a blog post for another day...after we actually install them and they aren't just sitting in a pile in our house. Oh to dream an impossible dream! In summary, we'd like to say thank you to everyone who chimed in and supported our possibly dysfunctional crowd sourced opinion on our nonstandard beadboard purchase. The beadboard has grown on us, and seeing it just with the coat of primer opened our eyes to the fact not only is it "not that bad," perhaps it could even be seen as "okay," or even, "pretty nice." Only time will tell. I love how it looks primed and in the space (even despite the construction zone going on behind it). The scale looks perfect next to that window. I'm glad you're keeping it as-is! Construction zone? What construction zone? :-) Yeah, we're decidedly "mid project" and can't wait to get to the finished walls/trim/room. But this is definitely a major step. It looks much better primed. Whheeew. That was a close one. Totally! I'm way in off the ledge now. Glad to hear you got over your buyer's remorse. There is nothing worse than regretting such a big decision! Niiice! I think when you're done this could look even better than the boards in your inspirational bathroom photo. I am glad for you guys that painting will do the trick! I really hope you're right and that all of the various layers and textures will combine to make the wainscoting fade into the background as just another element that makes the bathroom look great. That's the plan at least. It is amazing what some primer can do. I imagine it will look better with each step, and in the end the bathroom will be fabulous! Thanks, kim! We both agree and hope you're right. Wonderful! 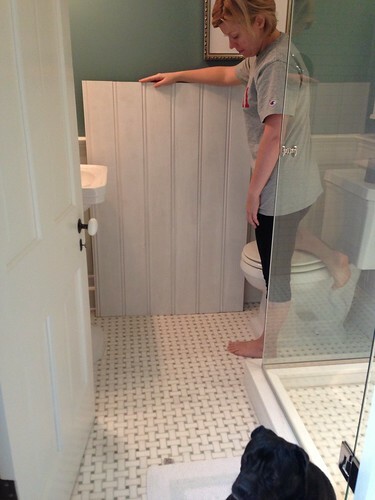 So glad you're getting into the beadboard; I love it. I think it will be a standout feature of your bathroom project (of course I can't wait to see all of the other fabulous things you're doing in there!). Oh bad doggie (I chuckle). Many of the dogs and cats we've had over the years have been inordinately helpful and super-interested in home improvement projects. We're big softies and generally find their antics more amusing than annoying. We have a list a mile long of things we're doing in this bathroom to make it stand out as one of the cool kids on the block, but the wainscoting has been something I've been excited about for some time, so I'm so happy we're liking it now. We have to laugh at the number of times Lulu has somehow gotten our supplies (of any sort) on her. Mel's only done it once or twice, but it doesn't matter what I'm working with, if Lulu is nearby (not even in the same room), she has it on her. It's pretty hysterical. Isn't it amazing how light and color (even white) can have such an impact on your impression of something like this. Keep in mind, these 2D images can't even do the depth the shadows creates justice. It should turn out really nice. Ha hah, yay! Glad you have been able to breathe again. I too am much more pleased with how it looks white than the raw wood state. I think you will be able to look back on this panicky moment in time with fond remembrance when you see your very nice finished beadboard up with no additional labor necessary to re-work it. I guess instances like these make good memories or points of reference when something similar happens in the future. And had we re-worked it, well, there would have gone at least one more weekend. Oh, bummer. I never commented but I fully expected Alex to break out the tools and add the needed details. Sorry to disappoint, Will. :-) No tools coming out this time, but I'm sure we'll freak out over another project in the near future! First of all, thanks for “kind, knowledgeable readers”. Secondly, I’d like to tell you that there is no need to doubt, as your idea is great. As far as I could see it from photos you have installed them correctly and prettily in one room, so they will look great anyway in your bathroom. You mentioned everything describing all steps you’ve followed but I just wonder how long the process was? Could you write exact time it took you? Sometime in future I’m about to do the same.